Happy New Year! We at Story Stage hope that you all had a restful, happy holiday. While we are thinking of lesson plans and new improv scenes, many of you may be thinking of your New Year’s Resolutions. Do you guys make them? I have to say, I’m not a big resolution-making kind of gal. Inferencing is a big part of what we teach at Story Stage, so I am always thinking about new games and activities to help our kids learn this important skill. When you make an inference, you combine what you observe (usually fact-based information), with what you know from past experiences. These two things together lead you to a logical conclusion or assumption about what’s happening now. Prediction is also closely related to inferencing, but when we predict, we draw conclusions about what might happen in the future. Inference is about the here and now, the current state of affairs. Resolution: I would like to spend more time reading my Bible. Prior Knowledge: People who read the Bible are usually Christian. Inference: You can assume that I am a Christian who likely attends church and didn’t spend a lot of time reading my Bible last year. Resolution: I would like to actually make myself take my lunch break. Facts: I must not usually stop what I am doing to eat lunch. Prior Knowledge: When people are busy or stressed they often don’t take time to eat. Inference: You can assume that I have a job. That job must be fairly demanding and probably pretty fast-paced. Last year, I skipped lunch all the time. Resolution: I would like to delegate more chores. Facts: Delegate implies that there are other people involved. Chores are usually referring to work that people do around the house. Prior Knowledge: I did chores as a child in my household. My mother was the one who told me what my chores were. You could easily play a New Year’s Resolution game with your students by guiding them through the process above, and then creating a matching game for them to match resolutions to inferences. We can’t wait to use some resolution-inspired improv games with our Story Stage students this semester, because understanding this skill is so very important across the curriculum, not just in reading. In math, for example, students are expected to evaluate inferences based on data in word problems; and in science students hone their observation skills, but then need to make inferences to form hypotheses and offer explanations of their data. On a recent visit to see my son, Sam, at college I had a couple of days to wander around the city while he was in class. Poor me, I have to go visit Sam in New York City every once in awhile. Thank you, Sam and NYU. I wandered over to the Whitney Museum, which may not be at the top of your list when you visit NYC, but it totally should be! Right on the Hudson River tucked between Chelsea and Greenwich Village, the Whitney is full of wonderful contemporary American art and offers great views from its outdoor terraces. You really have to go...and if you do, you have to stop at some of the toy stores I found along the way! (Oh yes, there are lots of high-fashion stops you could make as well...shoes, clothes, purses, make-up. Totally. There’s all that.) But that’s kind of not my jam. I like toy stores. You might be thinking, “Aren’t your kids a little old for toys?” Yes, yes they are; but I’m not. I love toys, particularly those that inspire creative, meaningful play. My favorite on this trip was Teich Toys in the West Village. It was there that I found this great little card game for inferencing, GUESS WHO? SPOT THE BAD GUY. You can find it on Amazon, but I’ve not seen it before in another store. Let me know if you do! I’ve played this game with kids as young as 7 up to age 15, and they all ask to play again. 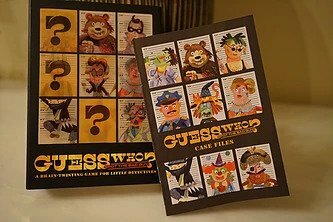 There are 25 character cards, each depicting a detailed drawing of a potential “crook.” To play, all cards are placed on the table to be examined as the host reads a crime from the case files. 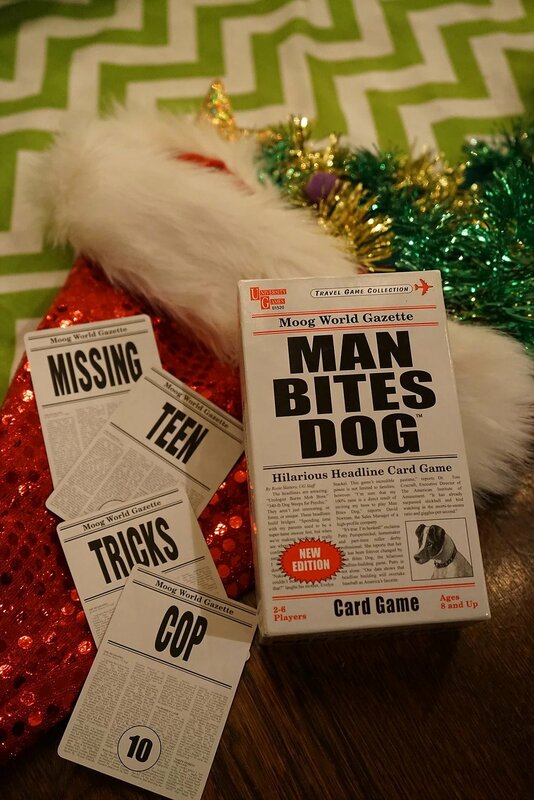 An example case file reads, “Who nibbled on the chocolate cake?” Players must examine the character cards for clues, and can ask the host for more facts if needed. The first clue in this case is, “Some strands of animal fur were found near the cake.” Ah-ha! Well, we must infer that the crook may have a pet! This narrows the search! It’s great fun, and easy to point out the factual details in each character drawing that might contribute to drawing an inference. If you are a classroom teacher, check out this lesson plan for inferencing from The Teachers’ Cafe. 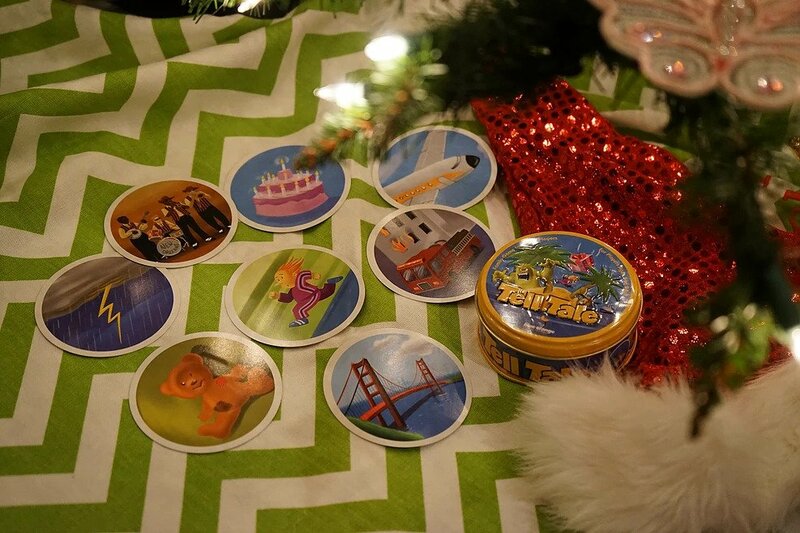 There’s a fun matching game that would be great to use with 3rd - 5th graders. 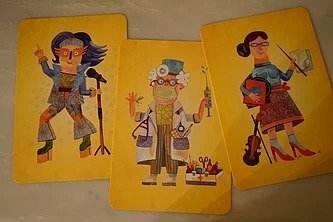 I absolutely love this Detective’s Notebook Game from PBS. It includes inferencing and predicting, so make sure your student or child understands the difference before you play. Love, love, love this Jeopardy Game! You can play with one player or several; in teams or as individuals. Great for classrooms or one-on-one with your child at home. 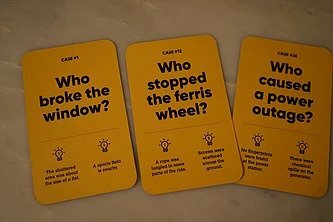 Riddles are great for inferencing, and I love the way this web-based game allows you to scaffold the clues that your child needs. The graphics aren’t fancy, but the concept is strong. Okay...this might be my favorite thing ever. You MUST check this out for your students who are 13 and older. Every week, the New York Times posts pictures for students to draw inferences from, and they ask the good questions: 1)What’s going on in this picture? 2)What do you see that makes you say that? 3)And what more can you find? To see this week’s photo, click here! There’s also this great article on how teachers and others have used these prompts. One last note...be sure to guide your child to understand what an inference is and what it isn’t. First and foremost, an inference is NOT a guess. When we make a guess, we are not paying attention to any facts, observations, or past experiences. A guess is a shot in the dark. An inference is also NOT a prediction, although they are closely related. Predictions and inferences are BOTH based on observations + past experience. They both use logic and reason to come to an assumption or conclusion. The biggest difference is that when we predict, we are thinking about what might happen next; when we infer, we are thinking about what is happening now. Come back next week, when I’ll share my favorite wordless picture books and tell you how I use them to help children conquer inferencing. My Kid Needs Testing...Now What? If you are like me, you recently sat down with your kid's teacher to get a report on how the Fall semester is progressing. These days we have a lens into the grades our children earn on a day to day basis, if we desire. One click-click-click into the school portal, and we can often know about that history test grade before sweet thing even gets into the carpool shuffle. (No more hiding that 65 until you could redeem yourself on the next test like in the good 'ole days!) With access to such a constant stream of information, it may have been no surprise to hear your kid's teacher say, "You may want to look into having him tested." But now what? Who does this sort of testing? That's why we are so excited to bring you this new series on the Story Stage Blog! Over the next few weeks, we will introduce you to some of the fabulous professionals in our community who do testing, tutoring, therapy, and more. We'll talk about their backgrounds, experience, and what they do best. Our hope is to introduce you to some of our most trusted colleagues, to demystify the process of finding help for your child, and to answer some of the questions that you haven't been sure who to ask. 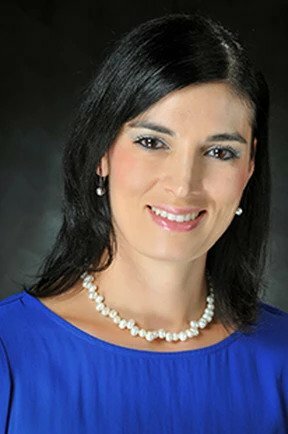 We are delighted to start off this series with a conversation with Dr. Neslihan Chandler, one of Fort Worth's most respected psychologists for children and adolescents. She's got a ton of great insight to share with y'all. Why did you decide to become a clinical psychologist? I actually decided to become a psychologist when I was in high school and I took my first psychology class! I feel in love with the idea of helping children and families through mental health. Once I knew what psychology was, I was driven to get the highest level of education needed to help families. There are so many professionals who test kids! How do you know whether to get testing from a clinical psychologist or a neuropsychologist or a “regular” psychologist? What’s the difference? So, there is no such thing as a “regular” psychologist. There are many different types of psychologists: clinical psychologists, clinical child psychologists, neuropsychologists, school psychologists, and even forensic psychologists. Just like any other field, psychology has lots of areas that one can specialize in. A clinical psychologist can specialize in working with adults, working with elders, or working with children. Then within those populations, you can specialize even further (abuse and trauma, depression, anxiety, inpatient populations, outpatient populations, etc.). Some clinical psychologists specialize in assessments and then further specialize in testing with pediatric populations. Neuropsychologists specialize in evaluations with populations who have had significant brain trauma or have a significant medical history (concussion, traumatic brain injury, chemotherapy and radiation, genetic disorders, etc.). However, for more common psychological disorders, such as ADHD, Autism, Learning Disabilities, Intellectual Disability, Anxiety, and Depression; a clinical psychologist who specializes in psychological assessments with children can easily assess for these conditions. Therefore, when looking for a psychologist to assess your child, be sure to ask for referrals from trusted medical professionals, check to see if the clinical psychologist specializes in testing for the condition you are concerned about. Make sure the clinician has the proper credentials to diagnose the condition (Ph.D over a Master’s degree), and ask lots of questions about the process. A skilled clinical psychologist will be able to answer all your questions and provide you with details of how they can help your child. Who decides that a student needs to be evaluated by you? Do parents need a doctor’s referral? Anyone who has concerns for the child can decide if the child needs an evaluation. Teachers, parents, pediatricians, school learning specialist, speech therapists, occupational therapists, etc. can all recommend to the parents that a child could benefit from an evaluation. When parents first call me, I spend lots of time asking questions about the referral problem. Once I know what issues needs to be assessed, I offer an individualized plan for the assessment process based on the specific needs of the child. A referral from a doctor is not needed. What happens to a student after he is evaluated? After the evaluation, I spend several hours scoring the measures and writing the psychological report. When the report is complete, I schedule an appointment with parents only to go over all the results. I go over each measure, item by item, explain to the parents if a child meets criteria for a diagnosis and why, and go over all my recommendations for their child. The recommendations are very specific to the needs of the child based on the results of the testing. Parents leave my office with a name, a number, and specific details about what other resources can help their child. I also provide 3 copies of the report to the parents as well as a PDF of the report. You were a clinical psychologist at the Child Study Center before going into private practice full time. How has that shaped or influenced your practice? I was at the Child Study Center for 5 ½ years where I completed my post doc training and then worked in the psychology department. CSC was an invaluable experience where I learned the highest standard of care for psychological testing and patient care. I was exposed to many different clinical populations including autism spectrum disorders, ADHD, intellectual disability, and learning disabilities. I had outstanding leadership and supervision, was trained on the ADOS (Autism Diagnostic Observation Scale), and was given the opportunity to evaluate over 900 children! I used these experiences and standards to help shape my private practice by carrying over the same high standards of care I learned. I am forever grateful for my experiences at CSC. What I love about my practice now, is that I have flexibility to spend lots of time with the families I serve; am constantly learning about new, wonderful referral resources for families (like Story Stage! ); and am able to carry on relationships with families after the evaluation is complete to continue to offer resources and support. It seems like so many more students struggle with anxiety these days. Do you see a lot of anxiety issues in your practice? How is it helpful to have an anxious child tested? Unfortunately, I do see more anxiety these days as well. Our kids have so much on their plates these days- school, sports, friends, other extracurricular activities. If a child also has some other issue, like ADHD or a learning disability, it can all add up and just become overwhelming. 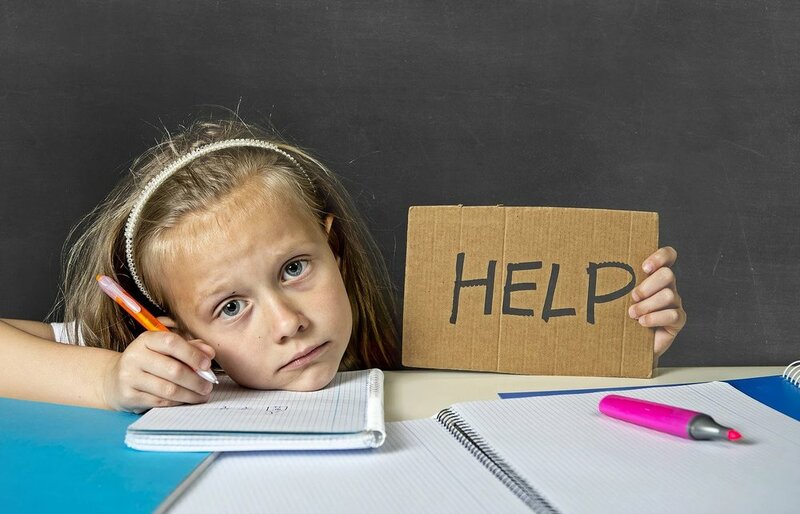 Having an evaluation to see if your child is struggling with anxiety can be very helpful to help figure out what resources can best help your child. Remember that there are many different areas of specialty in the field of psychology. Some therapists specialize in depression, some specialize in trauma, and some specialize in anxiety. Figuring out what is causing your child's difficulty is important so that the right resources can be put into place. Well, like every other job there are good things and bad things. I love working with the precious kiddos and I love meeting the families; but sometimes delivering the news of a difficult diagnosis can be hard. I am a mother too, so I can completely empathize with parents. But in a lot of cases, parents are relieved to know how to help their child. Families come to me for answers and help, and I try very hard to give them that in the most caring and nurturing way I can. If my child ends up with an ADHD diagnosis, can you tell me if you think she needs medicine? Can you prescribe it? I am not a medical doctor, so I cannot prescribe medication. I do however, let parents know when I think medication might be indicated and share that information with the child’s pediatrician (who is the one who will prescribe the medication). However, 9 times out of 10, I do not recommend medication right away because I like to try the “least invasive intervention possible." There are, of course, other cases where children have severe forms of ADHD and need medication due to safety issues or severe behavioral problems. In those cases, I assess each situation carefully to see if medication management is warranted. My child was evaluated in his public school about a year ago, and diagnosed with a learning disability. He is still really struggling with friendships at school. Is this because of his learning disability? How might your evaluation help us? Many learning disabilities, including ADHD, also cause social skills delays. So kids who have these diagnoses often struggle with friendships and social situations. If your child has already been evaluated one year ago, I typically do not think another evaluation is indicated. Often times, I will offer a free phone consultation to these families and give information on resources ...(like Story Stage!☺) that might help them with their social skills. However, if the previous evaluation did not address other concerns or new concerns have come up, a new evaluation might be recommended. The school where my child goes thinks she might be autistic. Can’t my pediatrician diagnose that? Typically, a pediatrician does not diagnose autism. Developmental pediatricians, who have received extra training on developmental disorders and delays like autism, can diagnose autism; but since there are so few of these type of doctors in the US, wait times to see one is long. A clinical child psychologist who specializes in assessing autism, (like me!☺ ) can assess and diagnose your child with autism. Due to my extensive training on autism spectrum disorder at the Child Study Center, this is an area that I am very experienced in. Wherever you go for an evaluation, be sure to ask if they use a ADOS-2 (Autism Diagnostic Observation Scale- 2nd Edition) in their assessment process. Many insurance companies will not accept a diagnosis (and therefore deny services related to the diagnosis) without an ADOS-2. The second post of this series can be found here. When Leigh and I started Story Stage, we had trouble finding the right words to describe the kind of kids we wanted to serve. As a speech-language pathologist, I had spent over 20 years seeing all kinds of students with all kinds of needs in public and private school settings, HeadStart programs, Early Childhood Intervention programs, and hospitals. All of the students I saw somehow “qualified” for services (through this or that standardized testing battery), and had come out of the process with a “diagnosis” that gave me permission to see them. That’s exactly what Leigh and I did NOT want to do at Story Stage. We had seen enough to know that the kids with formal diagnoses were not the only ones who needed a little extra help. What about the kids who scored pretty low on the tests, and were really struggling in the classroom or socially; but didn’t score quite low enough? Or the super shy or anxious kids who could use some social skills strategies? Or the kids who were just a little bit quirky (and are probably going to be rocket scientists one day), but couldn’t figure out how to make small talk? Not that there’s anything wrong with a diagnosis. Our own kids have them! Diagnoses have their place, and we often need them to guide us in finding the right professionals, or to convince the College Board that our children need extra time on the SAT. But we do not need them to define the wonderful human beings who are our children. Neither my child nor your child is a diagnosis, and it makes my heart smile to think of how much more our children are than that! Leigh and I wanted to build a program committed to seeing the whole child, diagnosis or not. So we decided that Story Stage would serve all students who learn differently. For us that simply means that our students need a different approach or a heightened focus on social skills and/or language skills to help them succeed in the classroom and with friends. Many of our students do come to us with a formal diagnosis. You’ve likely heard of most of them: ADHD, Auditory Processing Disorder, Language Disorder, Specific Learning Disorder, and Autism Spectrum Disorder to name a few. But we are also thrilled to be able to broaden our reach, and try to “catch” some of the children who tend to fall through the cracks for one reason or another. We are able to cast a wider net because Story Stage is not formal speech-language therapy or academic language therapy. Yes, those are our professional fields, but we will never tell you that Story Stage can replace your one-on-one therapy time if your child needs it. In fact, Leigh and I feel like one of our biggest roles at Story Stage is to help guide parents to the resources they need to help their child. All the professionals and terminology out there can be confusing and overwhelming, especially if you are new to the world of kids who learn differently. In this blog post, we hope to begin to clear up a few things. We thought it might be helpful to profile some of the inquiries we get, and give you an insider’s view into how we would respond. Note: These profiles and names are fictional and represent a compilation of many different students. However, they reflect the “typical” type of call we often receive. Spencer is a math whiz, and has the social schedule of a celebrity. Everyone wants to be around Spencer. He is good at making others laugh, and can also laugh at himself. Spencer’s parents recently went to his teacher conferences, and were told that Spencer is struggling with the writing assignments in third grade. Spencer’s teachers say that he has trouble organizing his thoughts into grammatically correct sentences, as well as putting sentences together logically to write a story. Spencer’s parents commented that when Spencer tells stories of his day at home, they don’t always make sense and are difficult to follow. They weren’t sure what to make of it, and they usually just helped him along as it didn’t seem to bother Spencer. Spencer goes to speech-language therapy once a week with a small group at his elementary school. Spencer is a great candidate for a Story Stage Class. Each child in our classes builds their own narrative story in the form of a play. Spencer would get lots of practice in story organization, while getting real-time feedback on whether or not his story makes sense as he and his peers act out scenes. Because oral language is the foundation for written language, Story Stage Class could really boost Spencer’s narrative writing skills. However, we also recommended that Spencer’s parents work closely with the SLP in Spencer’s school. We recommended they ask: 1) When is Spencer due for a re-evaluation? ; 2) Do Spencer’s goals for therapy include narrative language goals and/or sentence building goals? ; 3) Would it be possible for Spencer to go to therapy twice a week instead of just once? Geneva is a quiet, thoughtful teenage girl. She attended a public elementary school until 6th grade, but then transitioned to homeschool. Geneva has a formal diagnosis of autism spectrum disorder, and has been in therapy to work on social skills for many years. Her mom reports that Geneva does well in school when the material is straightforward and fact-based. However, as the curriculum has gotten more complex, Geneva struggles with questions that require her to make predictions about what might happen, draw inferences, and come up with solutions to problems. She has good ideas, but it often takes her a little longer to get them across. Geneva’s mom is hoping that a Story Stage Class might give Geneva a place to practice her conversational skills and problem solving skills in a safe, supportive group. All three of these students had great semesters at Story Stage! Alexa’s parents got her in to see a speech pathologist, but therapy was not recommended at the time. (However, we all felt better having ruled out something that might have required one-on-one intervention). Sometimes it helps to have someone who’s “been there” give you a few tips along the way. We love writing plays with your children, and we also love helping you along on this journey. What we love best though is that Story Stage is a place for the whole child, diagnosis or not. When we receive shocking news, we all remember where we were and who was with us. I remember where I was and who I was with when news arrived that the Space Shuttle was struck with disaster, or when the Twin Towers collapsed. These kinds of stories are part of the universal experience that unites us all. As a community we followed these stories as they unfolded and grieved for the suffering of the victims. We found resolve in a time of uncertainty and grew closer. We loved our loved ones a little harder and thy neighbor a little deeper. We asked why did this happen? What went wrong? How do I move forward? On the day I received the news that my daughter had a language disorder, I felt as if the rug had been ripped out from under me. That was five years ago, but I can still remember vividly where I was standing, what I was wearing, and what I was feeling at that moment. It wasn't that it was entirely shocking or surprising; I had certainly noticed that my daughter’s speech and language were delayed compared to her peers. On several occasions, Jenna's teachers and other professionals had even alerted me to Jenna’s speech delay. I also knew in my gut, as mothers do, that something was not right. But no matter what had been previously discussed, it did not prepare me for what I saw written in black and white. The results of the evaluation became real and raw when spoken by a professional giving a diagnosis. All I could think was, "Why did this happen? What does this mean for my child?" I was devastated. Of course, this is not on the scale of the world tragedies like the Space Shuttle crash or 9/11, but for me and my child…. our course had changed. Things would not unfold as I had envisioned. If you have a child who has been diagnosed with a learning difference, you know how I felt. It's those feelings of uncertainty for our children's futures, where the plans we had for our children suddenly seem turned upside down. It's that gut-wrenching feeling of not knowing where to turn, who to listen to, or what steps to take next. It's those days when we refrained from telling a friend or neighbor about any of it, for fear that our children would be judged or misunderstood. It's this day we grieved, suffered, and were left with questions. We felt alone and will remember this day when a doctor, therapist, or a diagnostician told us the story that changed our children's paths, and also changed us. For me… Jenna’s diagnosis gave me a bigger purpose in life. At the time, I was teaching in a private preschool that I adored. I began to see my role as a teacher in a different light, and became an advocate for children who were not meeting their educational milestones. I felt a new sense of responsibility to communicate with parents honestly about their children, and to share concerns from the classroom. I also decided to take my career in a new direction. I wanted to learn more about how to work with a child with learning differences. 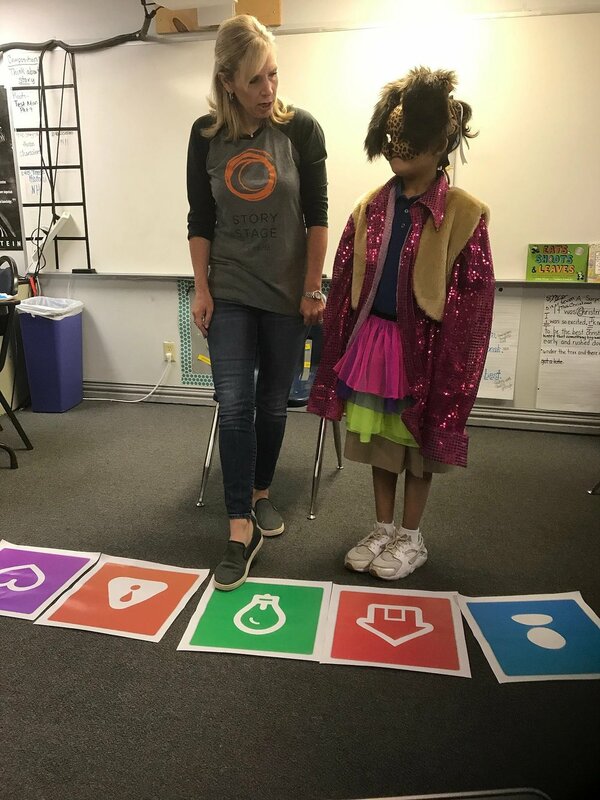 Not only did I want to help Jenna become a better reader and writer, but I also wanted to help other children who would need the focused, intentional learning that children with learning differences require. After much research, I decided to train as an Academic Language Therapist, through The Academic Language Therapy Association and the International Multisensory Structured Language Education Council. Today, I am so happy to be an advocate, not just for my child, but for other children who struggle as well. Through Jenna’s story, I found my people, my passion, and the joy that comes when we help kids find and see their true potential. Today, Jenna is a bright, spunky eight-year-old who always wears a smile. And yes, she has a learning difference, and her brain is “wired” differently. With the right support and interventions, Jenna (like all children with learning differences) can do well in school and grow into a successful adult. Yes, her journey may be different. My journey is different, too, and most days I'm really grateful for that. I can remember my wise grandmother telling me, "Through pain comes triumph." As a teenager, this sounded odd to me. Why must we experience pain to feel or do good in this world? I didn’t understand then, but now as an adult, I do. Beautiful and wonderful things can appear out of tragic times. It doesn't necessarily take away the pain, but goodness can be found. It is my hope that wherever you are in your child’s story ... a new diagnosis, or one you've know about for years ... that you will share that journey to help other parents. I invite you to subscribe to our blog so that we can share here. There's no judgment here. In our community, you are not alone and many of us have learned to see the beauty in our children’s personal stories. Here in the pages of our Story Stage blog we hope that you will find a sense of community, guidance, resource and direction. We hope to help you and your child navigate their story.